Large books are shipped by USPS Priority Mail at the Medium Flat Rate Box- $20.00 whether 1 book or a full box. For small paperbacks see below. Bamboo - The Amazing Grass - Amazing and rare tropical species are pictured in 72 color photos. This book introduces the bamboos of Southeast Asia, a region well known for its incredible range of bamboo utilization and diversity. The author, a bamboo specialist in Malaysia, discusses the salient aspects of bamboo structure, biology and conservation and provides brief perspectives into the sometimes difficult tasks of bamboo classification and identification. Weight is 10 ozs. Only $9.00 for shipping a single copy by USPS or may be combined with one other small book. A Compendium of Chinese Bamboo This is the book we have all been waiting for. As expected, the experts from China have crafted a classic volume based on clear descriptions and the best photos of mature bamboo species I have ever seen in one place. Altogether, 39 genera and more than 500 species are included in this book. The morphological characteristics, geographical distribution and usage of every species is described fully and accurately. 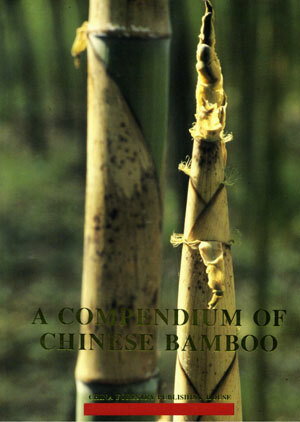 The compendium is the most complete monograph in the field of bamboo research up to the present. There are more than 400 color photos displaying 31 genera, 209 species and 50 varieties and forms. Most of the photos are close up views of bamboo shoots allowing for their use in bamboo identification. Many of the photos show the leaf, flower and culm distribution. A lot of the bamboo photographs are of beautiful species and varieties that have never been seen in the U.S.A. Catalog of the Bambouserie Prafrance (English) - The very well done catalog of Europe's largest bamboo plantation and nursery. Beautiful color photos and illustrated key. Weight is 14 ozs. Only $9.00 for shipping a single copy by USPS or may be combined with one other small book. NEW BOOK - Discovering Bamboo - Northwest nurserywoman, Jackie Heinricher published a nice catalog useful to all gardeners who have caught the bamboo bug. Considering there are hundreds of bamboo species and varieties availbale to the gardener, she has listed 28 clumping and 29 running popular bamboos species. Plenty for most gardeners and their landscapes in temperate and mild Pacific Coast climates. Lots of "How to" information to get you started. I personally like the selection guide to help narrow down the choices. 1985 Recent Research on Bamboos - Proceedings of the International Bamboo Workshop, Hangzhou, People's Republic of China-October 6-14, 1985. Since Hangzhou, there have been numerous International Bamboo Workshops: 1988 - Cochin, India, 1991 - Chiangmai , Thailand, 1995 - Ubud, Bali and San Jose, Costa Rica, 1998. I place great importance on these proceedings from Hangzhou, if only for it being the only one in a temperate region. Many of the papers are on topics of bamboo production with relevance for the new bamboo growers in the USA. The species most represented in the proceedings is Phyllostachys heterocycla pubescens or what we call Moso bamboo. 1988 Bamboos: Current Research Published jointly by the Kerala Forest Research Institute, India and the International Development Research Centre, Canada. This edition is the latest compilation of research papers presented at the Third International Bamboo Workshops convened at Cochin, India in 1988. As with the previous edition (Recent Research on Bamboos), the book is divided into various aspects of bamboo research. Country reports and bamboo resources papers by predominantly Indian authors outline the state of the bamboo resources in international, regional and ecological niches. The forestry and horticultural fields are represented in chapters devoted to management of bamboo forests, growth and yield of bamboos, propagation of bamboos, and diseases and pests of bamboos. A good percentage of the articles are on bamboo preservation treatments, physical properties of bamboo and its fiber. Bamboo as a building material for housing with a structural design code is described. Bamboo paper, board, pipe for water supply and the economics of bamboo based industry in the Indian sub-continent and Southeast Asian region outline bamboo affairs in that part of the world. 1991 Bamboo in Asia and the Pacific Reprinted. This is an excellent book containing the proceedings of the 1991 International Bamboo Workshop held in Chiangmai, Thailand. The broad area of participation includes most of Southeast Asia and the clumping bamboos of economic importance. Excellent articles on micropropagation, bamboo agroforestry and newer methods of making bamboo composite materials. Only $9.00 for shipping a single copy by USPS or may be combined with one other small book. 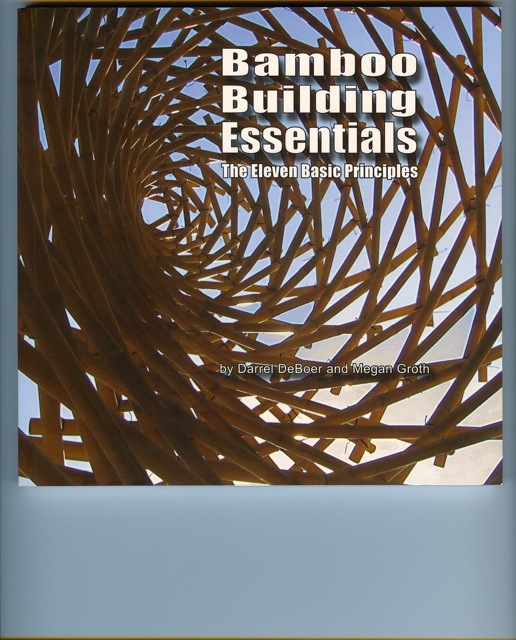 Bamboo: The Gift of the Gods -Oscar Hidalgo's New Bamboo Construction Book. The bamboo user's textbook from the world famous Colombian architect. His lifetime work is compiled for easy search and interesting reading. His interest in Guadua bamboo began forty years ago while he was a student. Now this experience is presented from the ground up. The plant of 1000 uses starts from the basics of growing and understanding how and where the plant grows. Sequential chapters discuss the properties of the usable bamboo culm and processing bamboo into the many types of products we have grown to love. His love for bamboo is expressed throughout the book while sharing the culture of bamboo he documents so well from around the world. Hardbound, 8.5 X 10.5 in., 556 pages, 670 photographs and 1200 line drawings, 2003. 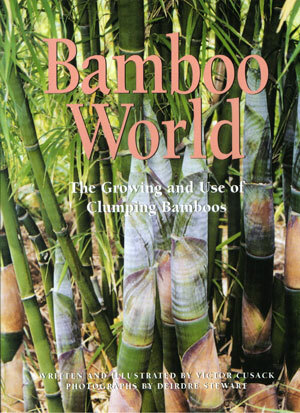 I first purchased a copy in Spanish at the 1998 International Bamboo Congress in San Jose, Costa Rica. My first impression was "I wish this was in English". My wish has now come true with a bonus, the English version has 12 additional pages of color plates. Architect and author, Virginia Carmiol begins with general bamboo information that is so important for the reader new to bamboo. This includes the categories of utilization we are familiar with: construction, food, architecture, engineering, craft, music, medicine and paper making. She also provides a basic description of bamboo's characteristics as a plant. The beneficial theme of Golden bamboo or Phyllostachys aurea is custom made for North Americans. In many areas, it is considered a pest by the locals. Here is our manual to put all the available Golden bamboo to good use by bamboo craftspeople. Costa Rica's climate ranges from tropical low lands to temperate cloud forest. While Phyllostachys aurea thrives above 6000 feet elevation it will also grow, but smaller, down to about 800 feet. Ms. Carmiol also tells us about Bambusa vulgaris, Dendrocalamus giganteus and the Guaduas. Interestingly, besides the ever popular, G. angustifoia, she also mentions G. aculeata, G. amplexifolia and G. paniculata. In the final chapter of Part 1 she tells of the story of bamboo development in Costa Rica. We find how the National Bamboo Project (FUNBAMBU) was established. Brian Erickson is credited by giving the project its own furniture style. However, earlier credit for the use of bamboo and furniture styles came from the Taiwan Technical Crafts Mission created in 1981. Even as early as the 70's, the University of Costa Rica through architect Rafael Angel Garcia and agronomist Mayra Montiel began developing interest in bamboo. It is noted that the government's efforts were primarily on species beneficial for the construction of housing - these being Guadua and Dendrocalamus. In Costa Rica (and in Mexico) there are established artisan centers producing furniture from Phyllostachys aurea that vainly seek government support. These craftspeople are facing design problems, overharvesting and pressure from outside bamboo cutters, low wages, and cheap imports from China and Korea. The rest of the book is devoted to the specifics of Phyllostachys aurea and the crafting of bamboo furniture. She begins with the botanical characteristics, cultivation, climate and plantation care, then moves on to describe the harvesting, processing, drying and curing the Golden bamboo culms. The bamboo furniture design is mostly of a traditional Chinese style, as taught by the Taiwan Mission. It is constructed entirely with simple tools. Great detail is spent on the steps required to build the furniture. These steps include cutting, perforations, curves, bending, assembly, pinning, joints, channels, binding, ties and ergonomic dimensions. Examples are given of chairs, tables, beds, panels, shelves, stands, mirrors, folding screens and more. Most of the examples represent the work of the Retana brothers' factory located near the City of San Isidro de General. The book is highly illustrated in a step-by-step manner with drawings and photographs. There are 182 B&W photos and illustrations. The English version includes 31 color plates (Spanish does not). It is paper back and printed on glossy paper. The dimensions are 8.5 X 8.5 inches. It consists of 182 pages. LAST COPIES IN PRINT! Weight is 16 ozs. Only $9.00 for shipping a single copy by USPS or may be combined with one other small book. 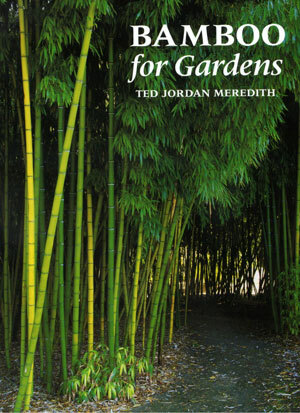 Bamboo for Gardens by Ted Meredith. Let the truth be said, through education and brilliant photography Ted Meredith overwhelms the fears of planting bamboo. This is the grail guidebook for selecting the correct bamboo for the landscape situation. All of the horticultural factors of bamboo are delivered in one beautifully illustrated and easily read bamboo garden book! Autographed by the author! 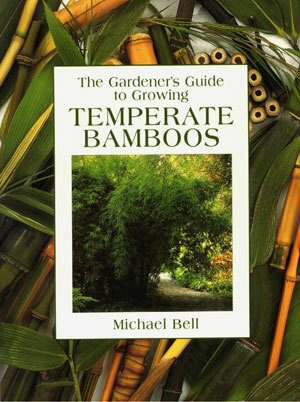 The Gardeners Guide to Growing Temperate Bamboos by Michael Bell An invaluable guide to bamboos, this book covers their cultivation, history, Propagation, and garden care. Superb photographs aid identification, and it has an A-Z listing plus appendices on bamboos for special purposes and where to see and buy them. 160 pages, hardbound or paperback, 70 color photos and 10 illustrations, 7 X 9.5 in. Bamboos by Christine Recht and Max F. Wetterwald Bamboos are fascinating for their utility, beauty and elegance, for their variety of form, and for their symbolic importance in Asian culture. 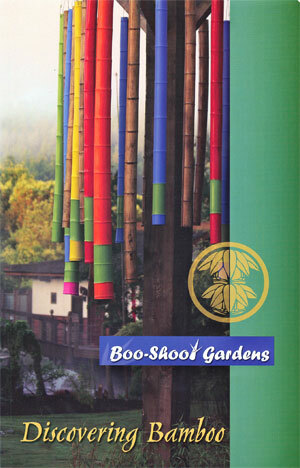 This book provides all the necessary information to successfully plant and grow bamboo in the garden. It includes chapters on the uses of bamboo; morphology and structure; characteristics of the major genera; species and cultivars for the garden; planting and cultivation; garden design with bamboos; bamboos in containers; bamboo as a raw material; and problems encountered in cultivation. The book is a good basic primer for the beginning 'bambusiast'. Photographs show many of the species carried in the Tradewinds Catalog. The Book of Bamboo by David Farrelly Shows how bamboo has been used for thousands of years and its importance for sustainable food and fiber production in the future. Culturally appealing and eclectic! The Bamboo Handbook - by Durnford Dart -This practical guide for growing bamboo provides detailed,accurate and valuable information for existing or prospective growers. More like a farmers guide, the economics of growing bamboo on the farm are spread over 5 years (Bambusa balcooa, B. oldhamii, Dendrocalamus asper, D. brandsii, D. latiflorus, Gigantochloa atter, Phyllostachys pubescens and P. bambusoides) with tables detailing expenses and income in Australia. With this in hand the bamboo grower may see the endless possibilities for environmental enhancement and the establishment of potentially profitable products and business. NO OTHER BOOK DETAILS THE START UP COST IN ESTABLISHING A BAMBOO FARM. In Australian English. Weight is 11 ozs. Only $8.00 for shipping a single copy by USPS or may be combined with one other small book. Bamboo Rediscovered by Victor Cusak -The book is divided into three parts: Part 1, Choosing and Growing Non-invasive Bamboo, Part 2, Bamboo Uses and Simple Technology and Part 3, Culture, Tradition and Uses. All the information needed for a beginner to start off with bamboo. Yet, the experienced grower will find Victor's species list and descriptions invaluable. Bamboo World by Victor Cusak and Dierdre Stewart. Victor's latest book is a much expanded glossy production of his previous publication "Bamboo Rediscovered". It is a colorful Bamboo World, filled with more than 200 colour photos, many of exotic species photographed all around the world by Victor's wife, Deirdre Stewart. With 230 information packed pages and 66 illustrations, it is a marathon of bamboo information. Well, the species are half of the bamboo world. The clumping species of bamboo inhabit these pages in all their glory; big, fast growing and tropical to sub tropical in climate. Chapters start with the advantage of clumping bamboo over runners and go on to their growing and use. Did I mention the amazing photographs! The 'using bamboo' chapters are actually a big "how to" book on there own, and the simple techniques work for runners or clumpers. Make a shakuhachi flute or an Indonesian xylophone, build beautiful furniture (complete with designs), or water toys; study advanced edible shoot or timber plantation technology, harvest and cure your own timber culms. It covers shoot preparation and cooking, recipes, making your own bamboo paper, building, architecture; it's all there in extraordinary but simple detail, and beautifully illustrated! When you are finished building then review the bamboo recipes for dinner. The Bamboos by F. A. McClure -The indispensible classic on bamboo by America's most famous bamboo expert. 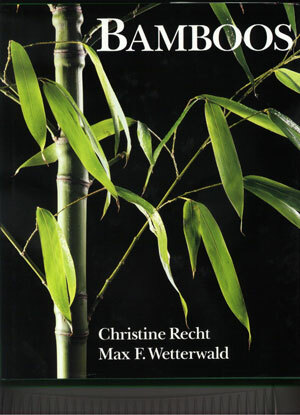 Contains a wealth of information on the study of bamboo. The Anatomy of Bamboo Culms by Walter Liese (ISBN 81-86247-26-2) Prof. Liese is a 50 year veteran of bamboo research. This book contains the bulk of his work studying and interpreting the cellular structure of bamboo. Numerous electron micrographs reveal the secrets of bamboo's extraordinary strength. 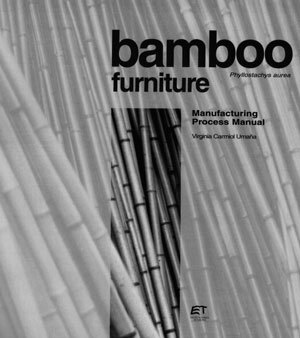 A reference text for those studying bamboo's application to various products. A piece of art for those interesting in functional design. Diseases of Bamboos in Asia INBAR Tech. #10 ISBN 81-86247-20-3 Insect Pests of Bamboos in Asia INBAR Tech. #13 ISBN 81-86247-20-8 "The above books are the only complete bug and disease books I have seen on bamboo". A cursory read suggested several questions right off-variegation on young Bambusa and Dendrocalamus seedlings caused by the mosaic virus?, black culm spots caused by fungus? Twelve species of bamboo mites and quantified damage information. -Robert D. Fabel-Ward Report on the Flowering and Fruiting of Arundinaria angustifolia (Mit.) Houz. de Leh. 7 X10 in., 53 pages, B&W photos. 7 X10 in., 28 pages, Color photos.